Spiñata Grande is a Net Entertainment-powered video slot with 5 reels, 4 rows and 40 paylines – you can play from as little as 20p a spin to as much as £200 a spin. This fun game has spinning piñatas and festive features with superb graphics and animations as well as a trumpeting Mariachi band. The game has Colossal symbols, a Mini-Slot feature and a Colossal Wild in the free spins feature. You will notice that every symbol has a colossal version that can appear as either 2×2 or 3×3 symbols big giving you bigger chances to win big. Then you have the Mini-Slot feature which is played when you get a Colossal Bonus symbol appearing anywhere on the reels. The Mini-Slot (the Papa Piñata) will appear as the Colossal Bonus symbol is revealed to offer you cash prizes and chances of free spins. It can turn into 3, 6 or 9 individual mini-slot symbols. You can benefit from scatters, free spins symbols, extra spin symbols and 3 coin symbols. Look for 3 free spins symbols as this will trigger the Free Spins feature. The extra spin symbol just gives you 1 additional free spin. Anyway, in the Free Spins feature you are given 5 free spins minimum (the extra spin symbol gives you more) – look out for the Colossal Wild which is a 3×3 block of wild symbols. If you get this a couple of times, prepare yourself for some colossal wins. My biggest return was just under 300 times my stake which occurred on my first time playing Spiñata Grande. I quite like this game and the theme is fun and entertainment. 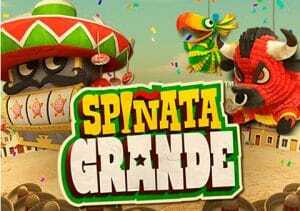 I found Spiñata Grande to be a medium variance game with the bigger wins coming in the Free Spins feature due to the Colossal Wild. If you like the theme, you should also try Esqueleto Explosivo by Thunderkick but I also recommend the superb Blood Suckers by Net Entertainment.